You began your career in the marketing department of Pernod where you rose to be international marketing director of Champagne Pommery. You joined the Bureau National Interprofessionnel du Cognac as head of communications in 2005 and, five years ago, became international marketing director for Champagne Lanson, before being appointed MD of SAS Larsen last year. What triggered your interest in the drinks industry and when did this become something you decided to pursue as a career? To be honest it was more by chance than design at the beginning, but Pernod Ricard (PR) was a wonderful group even if it wasn’t at that time what it is today. I use the word chance in two ways because it wasn’t a career plan, so it was by chance, but it was a fantastic opportunity and has given me the chance to do so much. I think the drinks industry is based on three pillars: passion, conviviality and business. I am a fairly passionate and convivial sort of person and I have a fairly good sense of business so it suited my personality. Once you are in the industry one thing leads to another and after a while you realise you know quite a bit about it, or at least an aspect of it. Today my expertise is in Champagne and spirits (mainly Cognac). But the real satisfaction is bringing new things to market and giving consumers new experiences and emotions. For example at PR we launched the Mojito in the early 2000s with Havana Club and I and my team at the BNIC created La Part des Anges gala charity Cognac auction, which is today the biggest spirits auction in the industry worldwide. It is celebrating its 10th anniversary in September 2016. We launched Lanson White label in 2011, the first champagne specially designed for mixology. What does your job entail on a daily basis and what, if anything, frustrates you about the industry you work in? Becoming a GM is clearly a big step. There is a lot of responsibility and certain pressures attached to the role but very few frustrations at the moment. Travelling takes up a lot of my time because the parent company of our two Cognac brands Larsen and J.A. Renault is Altia in Finland. Also because I still think meeting people face to face and getting to know different markets is the best way to do business. In the next 2 weeks, for example, we are launching Larsen Summer Blend and Winter Blend, a totally new concept of Cognac and eaux-de-vie for bartenders. We are also celebrating the 90th anniversary of the Larsen house this year with new packaging and new blends. What methods and techniques are your brands using to try and generate a deeper connection between its customers and its products? Things have changed in the past 20 years. Back in the day, the method was quite simple. It was basically the creation of demand in the on-trade and obtaining return on investment in the off-trade. With a strong on-trade programme, you could launch/build a brand. There is also far more concentration now with very big players, who will take hold of top on-trade outlets. On the other hand you have a lot of (maybe too much) innovation from the new ‘craft’ players. In between, the medium sized players like Larsen and Renault have to fight to find points of difference and distribution. In terms of distribution, access to some networks like the travel retail is quite impossible. Today, communication is more crucial and more complex. Consumers/customers have very a limited attention span because they are constantly taking in messages from lots of mediums (press, digital, professional…). Spirits actors need much more expertise now in all aspects of communication. Do you think that there is a fear to innovate within the drinks sector? If so, what are the causes of this? Absolutely not. I have never seen such innovation in the industry and I am noticing a lot of mixing and crossovers between categories and designations. There is a mass of creativity. A new vodka is launched every day and we have a tremendous gin boom right now. But creating is easy, it’s lasting in the market that is hard! You recently spoke at the annual Whiskies & Spirits Conference in London on the position of medium sized players in the market. How influential is the size of the company on success? I believe that medium sized players are able to try a different approach that focuses on innovation, adaptation, speed, external focus and finally growth. Myself and the people around me are able to take the strength and power of an idea and turn it into reality quickly. When you are big, life is comfortable. If you are medium sized you have to be passionate and work hard. When you are small, you are on a knife edge… (and it helps if you’re rich). What plans do you have for the future of the brands you work on? I am responsible for two Cognac brands: J.A. Renault is very much a boutique Cognac house and a niche brand. Its famous Carte Noire XO is known as one of the best of the category. Reflecting this, we are focusing on the theme of Time and the Cognac experience. We have offered a wonderful J.A. 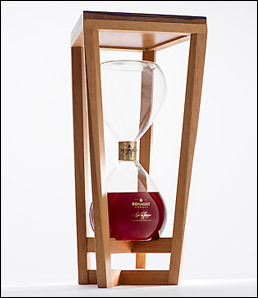 Renault Hourglass blend in a glorious decanter for 10th Anniversary of La Part des Anges auction. This is a one-off concept and proved to be a design challenge. We are launching a Heritage Collection with a new blend every year. In 2016 it is a pure Petite Champagne, vintage 1989. Exclusively for travel retail, we are developing a new range: Age du Temps with a triple cask maturation. The Larsen style is unique in Cognac. It is based on three pillars: fruit, purity and elegance. VS Larsen was elected Best VS at the World Cognac Awards in 2016. We love this style and our job is to explain it and communicate it. 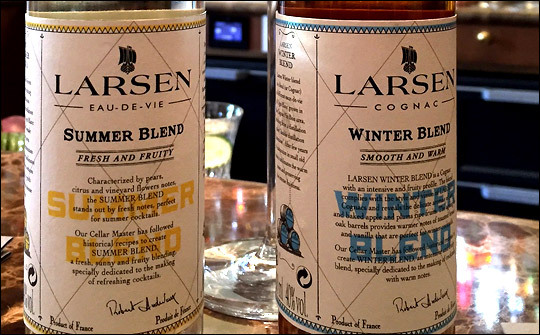 We are launching two new products that have been specifically created for use in mixology: Larsen Summer Blend and Winter Blend. Summer Blend which is delicate eau-de-vie fine and Winter Blend for winter cocktails, which is a round full fruity Cognac. They will be launched at The Boutique Bar Show in London on September 20. We are celebrating the 90th anniversary of the House with a limited edition Larsen tribute to Jens Reidar Larsen, the founder. This blend underlines the Larsen style in an original old bottle. What exciting developments can we expect from SAS Larsen for the rest of this year and next year? We have a lot of projects in the pipeline but the next priority is distribution. Larsen and J.A. Renault Cognac belong to the Finnish group, Altia which is the leader in the Nordic and Baltic countries. We are going to consolidate our position there and are going to open new markets. We are initiating France, USA, Czech Republic, Africa, Japan, and China but there are still other countries to open. In the next few months we will be launching new Larsen Extra d’Or, which will be one of the finest blends the house has ever done. The carafe for this will be in gold and has required us to use a coating never used before. Again another technical challenge but then innovation in packaging is what Cognac has been known for since the use of the first bottles. We have also been investing heavily in our production plant in Cognac in preparation for a strategic project that will launch in 18 months’ time. More of that later!